See Teddy in a Bag at Tesco Fratton Park (Pompey Centre) this Friday and Saturday. This is the first Christmas Craft Event that the store has hosted and it’s going to be great! There will be a cake stall, Flower arrangements ( Friday), yarn crafts- Children’s knit wear, handmade tree decorations and candles (Saturday), Santa sacks and stockings( Saturday), Pompey preserves are coming back (Friday), jewellery and novelty items, personalised box frames and wine glasses and hand made hair accessories (Saturday)! Teddy in a Bag will be there, sharing a stall with Little Gifts of Southsea, so, as well as our range of lovely teddies in bags, there will be loads of unique jewellery items, plus Christmas decorations, keyrings, children’s items, stocking fillers, and much more! The Craft Event runs from 10am until 4pm each day, in the lobby. so, please pop by and have a look before or after you do your weekly shop… or just because you want to see us! 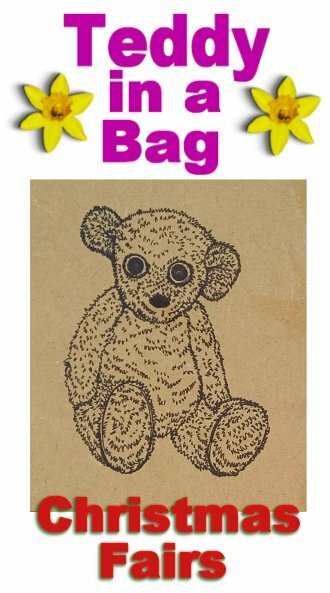 Posted on December 15, 2017 by Silvi VealePosted in Christmas Fairs, Teddy in a bagTagged all ages, Children's bags, Christmas Fayres, Older Children's Bags, stocking fillers, Teddy Bags. There is a large range of very affordable Stocking Fillers, including small crochet baskets containing small teddies wearing matching scarves; tiny teddies in organza ‘wing’ bags; and tiny teddies in crochet gift sacks. Not to mention a new range of mini tiny teddies in organza bags which make excellent stocking fillers for children over 3 years. There is a whole new range of small, reversible cotton bags, in many colour tones including blue, floral and teddy print. And all have a small teddy inside, wrapped in a crochet blanket. We have a whole range of Elephant Print cotton bags, including double-side shoulder bags, small reversible bags, two-tone tote bags, and children’s shoppers (with double pockets). There is a new range of cotton, double-sided shoulder bags, in a range of pretty prints. These make ‘best bags’ for children, and are large enough to be used by adults too. Those are just a few of the new bags made in the last few weeks. And, as stock is constantly moving, particularly at Christmas markets, I’m sure that there will be many more to show you in the New Year. Posted on December 15, 2017 by Silvi VealePosted in Cotton Bags, Handbags, Little Bags, Shoulder Bags, Teddy in a bag, Tote BagsTagged all ages, Children's bags, cotton, Crochet Bags, medium bags, Older Children's Bags, Shoulder Bags, small bags, small teddy, Teddy Bags, tiny teddy. The Castle Road Christmas Festival makes a great weekend out. Not only are there loads of interesting stalls where you can buy great Christmas gifts, but there is also a great range of music too. Have a look at the poster to see who is performing each day. And don’t forget to pop in and See Teddy in a Bag at the Little Gifts of Southsea stall. we are there on Saturday and Sunday all day. You’ll really like the gifts that you see there! Posted on December 1, 2017 by Silvi VealePosted in Christmas Fairs, Teddy in a bagTagged all ages, Children's bags, Christmas Fayres, Crochet Bags, Older Children's Bags, small bags, small teddy, Teddy Bags, tiny teddy.